1. Recent research has shown that around 50% of RPE used does not offer the wearer the level of protection assumed. This is because the respirator does not fit the wearer correctly. 2. Face fit tests are required by law under various health and safety regulations. 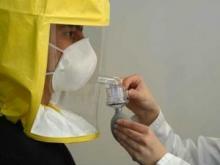 A face fit test will help to ensure that the respirator / mask used is fit for the wearer. SafetyNet Ltd is pleased to advise that it is able to offer face fit testing for workers who may be exposed to hazardous materials such as asbestos, silicates, dust, fumes and biological hazards. For further information on this service please contact us.